Escape to an island paradise and find intimacy, romance and natural beauty in a Bora Bora luxury hotel unlike any other. 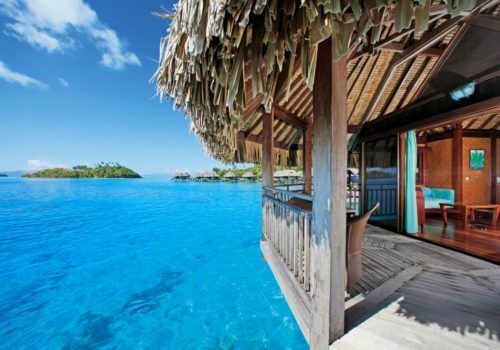 Sofitel Bora Pora Private Island is located on a lush islet in the crystal lagoon of Bora Bora. Embark on an unforgettable honeymoon or the holiday of a lifetime. On arrival at the airport the host whisks you to your boat for a 20-minute cruise through shimmering blue waters to the private island. 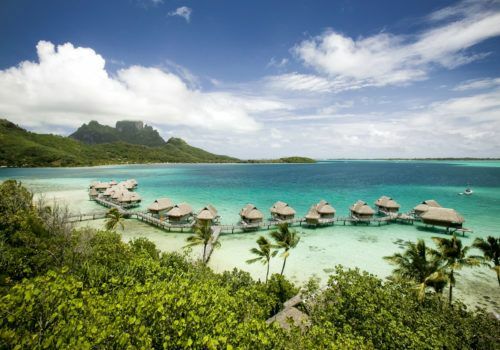 From the private island resort enjoy 360-degree views of endless ocean the island of Bora Bora and Mt Otemanu. The truly gay-friendly islands of French Polynesia allow you to relax and unwind in style and comfort. At the Sofitel Bora Bora Private Island you’ll find a hideaway like no other. An intimate retreat over a crystal lagoon you’ll be able to explore the colourful underwater gallery of the coral garden and unwind in an oasis of privacy marrying natural chic and Polynesian tradition. Often compared to paradise on earth, Bora Bora is famous for its romantic thatched-roof huts often on stilts over the water. The stunning blue reef are is perfect for swimming or snorkelling. But if you prefer you can hike the islands volcanic trails. At Out Of Office we believe French Polynesia is so special we will tailor each trip based on your requirements so get in touch for the latest offers and we’ll send you on the holiday or honeymoon of a lifetime. Stay for over six nights and you’ll receive a free flower bed, a free black pearl and one sunset champagne experience where you can sip champagne as you watch the sun go down over the island. There are many other options for honeymooners from arrange a private diving lesson to private candlelit dinners on the beach. Ask one of the team now who can help plan the perfect Bora Bora honeymoon. If you’re looking to get married in Bora Bora, whether you’re gay or straight, we can arrange the perfect Bora Bora wedding for you. You’ll need to get married at City Hall for the ceremony to be legally recognised, but you can then have a symbolic ceremony on the beach which offers you the chance to be accompanied by Motu Moahi Nui dancers, musicians whilst wearing leis.